I've now had my transmitter up and running for around 2 weeks. Soldering the power connector was simple. Set up was easy. I just connected the audio and set levels. The improvement between my previous CCrane and your unit was instantly obvious. The fidelity of LCD is outstanding. I have installed a 4 unit one rack space Behringer compressor/limiter between my computer and the LCD xmtr. I use two channels for compression, then two channels for limiting. I avoid overloads, and having to adjust the volume between various web streams. Best of all it still sounds good. Thank you for manufacturing such a quality product. PS I am a retired radio engineer. 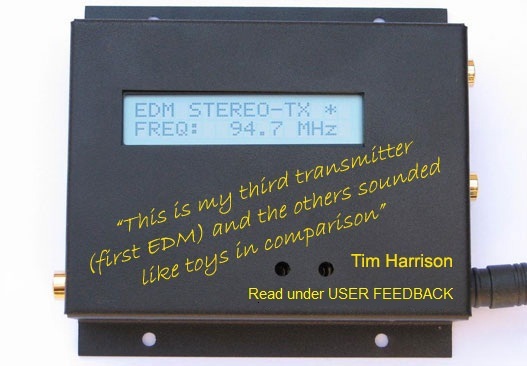 These are transmitters of choice for many Audio Professionals and Hobbyists worldwide. We have been producing kits since 2002. Our lines of transmitters are very affordable while providing performance that leaves most competitors in our dust. "I have heard other transmitters. 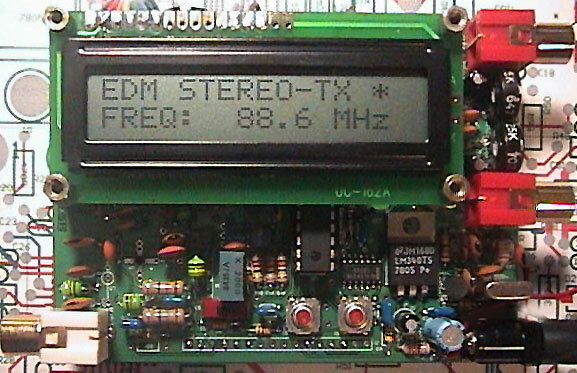 EDM LCD is the best by far. Even with just the test wire antenna it is clear and crisp with no hum. I have been using it for two years. Would not consder anything else". "Once you hear an EDM, you'll notice the clarity immediately."